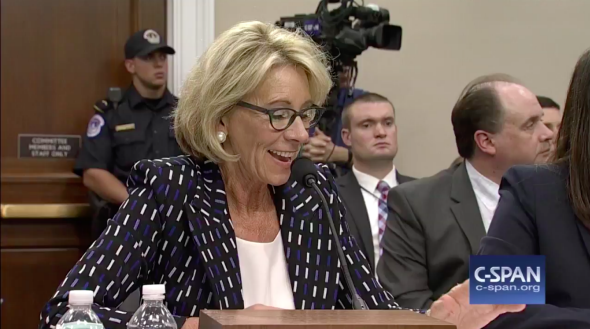 Betsy DeVos is all smiles as she endorses states’ rights to discriminate against children. The Secretary of Education, defending the right of states to turn minority students away from publicly funded schools. Betsy DeVos is loving life right now. In a Wednesday hearing with the House Appropriations subcommittee, the Secretary of Education gleefully defended her school-choice philosophy from Rep. Katherine Clark of Massachusetts, who asked DeVos whether charter schools that refuse to admit students of certain demographics would still get federal funding. Clark used Bloomington, Indiana’s Lighthouse Christian Academy as an example. The school currently gets more than $665,000 in state funding through a school voucher program, Clark said. It also openly reserves the right to deny admittance to any student in a family where there is “homosexual or bisexual activity” or family members who practice “alternate gender identity.” If Indiana applies for federal funding for schools like these, Clark asked DeVos, would her Department of Education require them to stop discriminating against LGBTQ students and families? “You are the backstop for students and the right to access a quality education,” Clark continued. “Would you in this case say, ‘we are going to overrule, and you cannot discriminate—whether it be on sexual orientation, race, special needs in our voucher programs’?” She also asked DeVos whether a school that refused to accept African-American students, for instance, would be eligible for federal funding under the voucher system DeVos endorses. DeVos calls what she’s endorsing “state flexibility.” States, she’s saying, should have the flexibility to exclude marginalized demographics from federally funded public schools if they deem it appropriate for their students. No cookie-cutter integrated school solutions for DeVos, who once praised education under Jim Crow as a pioneering example of school choice! The Secretary of Education wants students to have all of the options, including federally funded options that allow them to avoid learning alongside queer students, students of color, students of faith, or students with disabilities, if their parents prefer it that way.